Like a growing number of cities across North America, Vancouver allows homeowners to build an accessory dwelling unit behind the existing house provided there is a back alley. 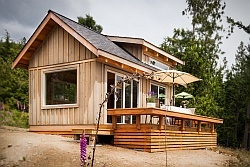 This laneway house, as they are called in Vancouver, was designed and built by Smallworks Studios/Laneway Housing, a firm that specializes in these small houses. Because this cottage is built on a corner lot, the front entrance was placed facing the flanking street. The roof overhang extends a bit to form a canopy over the bright red entrance door, which opens to a small entry area with a coat closet to one side and a staircase starting up on the other. The living room is straight ahead while the eat-in kitchen is to the right, facing the alley. The living room and kitchen are open to each other but subtly separated by the upper part of the stairs. 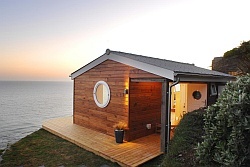 A bathroom is located in a shed-roofed ell opposite the entry. Rounding out the ground floor is a laundry closet in the kitchen area and some storage space accessed from outside. 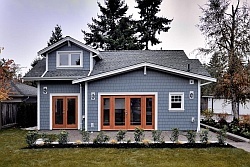 The owners chose exterior finishes and colors to match the main house. 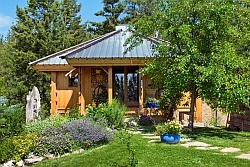 On the inside, Craftsman-style window and door casings relate back to the traditional exterior. Aside from that, the interior leans more towards the contemporary with polished concrete floors, glossy cabinetry, the subway tile kitchen backsplash and a cool shade of gray paint. The L-shaped stair lands in the center of the upper floor, providing efficient access to two bedrooms and a second bathroom. 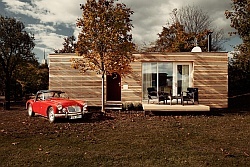 Altogether the cottage has 675 ft2 (62.7 m2) of living space plus 40 ft2 (3.7 m2) of additional storage. What an AWESOME place! And kudos to Vancouver for allowing the laneway cottages. Canada is SO ahead of us in the U.S. in SO many ways!!! Good to see this type of small development. Also good to see that the designers understand the value of pocket doors in small house design. But they need to re-think the use of in-swinging entry doors. 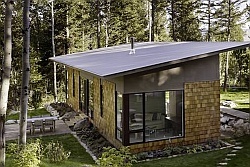 This house, and other small houses would benefit from using out-swinging entry doors. Put “tradition” aside and think how that in-swinging door chews up interior space and complicates function, circulation, and furniture placement. Could you post a floor plan for this house? Note — there were a couple of modifications to these floorplans for Susan!